Pivot tables in Excel are awesome. I love them. Drag, drop, slice, and dice data in seconds. Create charts and graphs. Amaze your friends. It’s all about the pivot tables, baby! Occasionally, you need more than just the data, though. You need to know the difference between two numbers, or the percentage of one number relative to another. This is where Calculated Fields come into play. I haven’t had a huge need for them in my previous pivot tabling, so I never really knew about them. When I needed a calculated field, I would create a column with the calculation I needed in my source data, and that worked fine. Today, though, I accidentally discovered Calculated Fields, and they are sweet. 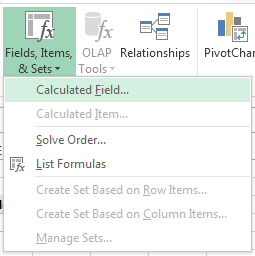 All you need to do to create a Calculated Field is click on the Fields, Items, & Sets menu in the pivot table ribbon, and select Calculated Fields…. 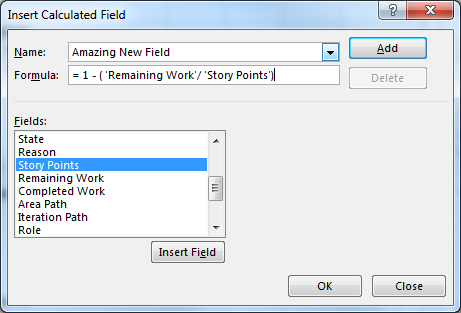 This will open a new dialog box that allows you to create a named field generated from a formula you create from the already-available pivot table fields. 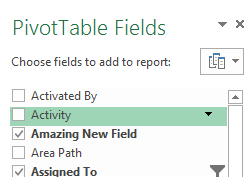 Once created, your Calculated Field is available in the Pivot Table Fields list for you to use as data in your pivot table!